The best approach is to use a relatively simple process of elimination. Run through a mental checklist of key features everytime a new animal is encountered at sea. The more features you are able to take into account, the better chance you have of making a positive identification. Becoming familiar with the most obvious features of your subject will help. There are not many places in the world with records of more than a few dozen species of whales, dolphins and porpoises. So taking the location into account immediately limits the number of possibilities. The tall dorsal fin of the male orca, the long black and white pectoral fins of a humpback whale, the long tusk of the male narwal, and highly distinctive features of some other species can often be usefull for a quick identification. Estimating size accurately at sea is very difficult, unless a direct comparison can be made with the length of the boat or something else in the water. But simply deciding whether the animal is small, medium, or large can help to eliminate a range of possibilities. 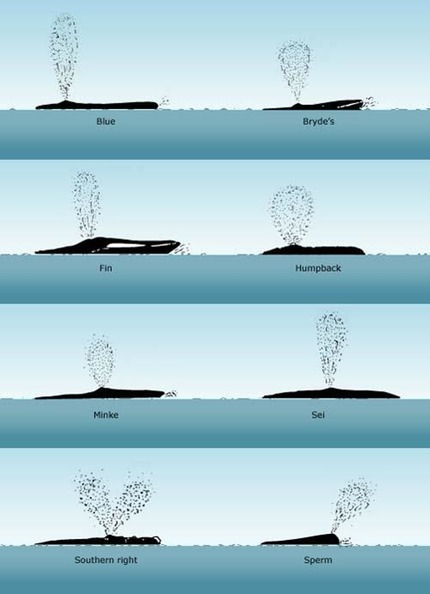 Some large whales lift the fluke high into the air before a dive, others do not. This distinction alone can help with identification. The blow is immensely useful for identifying large whales. It varies in height, shape and visibility among species and, especially on calm days, can be all that is needed for a positive identification. The way in which a whale dolphin or porpoise breaks the surface to breathe, and then dives again, is known as its dive sequence. In some species, this is very distinctive, although differences in others can be quite subtle. Most whales, dolphins and porpoises have been known to breach, pec- and tail-slap, spy hop, lob tail and perform other well-known behaviors at one time or another. But they all have slightly different techniques, and some are more active at the surface than others. 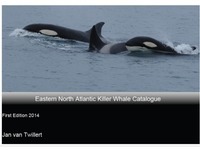 Source: Whales, Dolphins & Porpoises; Mark Carwardine, Erich Hoyt, et all.